... ... GNPC, SSNIT lead pack A whopping ¢1.3 trillion was lost to the state through mal-administration, malfeasance and corruption in 11 institutions, according to forensic audit reports covering the period between 1992 and 2000. The revelations were contained in an 11-page “Summary of the Forensic Audit Reports” sighted by The Chronicle. The audit was commissioned by the Kufuor administration on assumption of office following widespread allegations of financial mal-practice in a number of state-owned institutions. Among the auditors were Sterling Financial Limited, Morrison & Associates, Baffuor Awuah & Associates and James Quagraine & Company. The summary report attributed the massive loss mostly to fraud, carelessness and deliberate ploy and recommended the prosecution of the officials involved in any of the reckless transactions and retrieval of the huge losses by the state. It also recommended that companies that were engaged in questionable supplies be blacklisted. The 11 institutions that featured in the report were the Ghana National Petroleum Company (GNPC), Divestiture Implementation Committee (DIC), Bulk Oil Storage and Transport (BOST), Social Security and National Insurance Trust (SSNIT), Tema Oil Refinery (TOR), Electricity Company of Ghana (ECG) and State Insurance Company (SIC). Others were National Insurance Company (NIC), Ghana Water Company Limited (GWCL), Ghana Heavy Equipment Limited (GHEL) and the Ghana Reinsurance Commission (GRC). 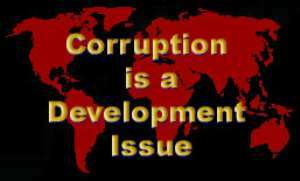 GNPC topped the league table of “who is who” in corruption or reckless financial management. It recorded the single largest loss among the 11 companies, including $40 million (¢344 billion) as a result of reckless engagement in derivatives, $38 million which resulted from the purchase of rigs, $1.0 million investment in Valley Farms Limited and ¢7.2 billion disbursement of an advance from CHD Financial Services. All these were without the approval of the board of directors, the report said. SSNIT finished second on the table with a loss ¢370,365 billion. It emerged that DM 2.78 million went down the drain in 14 different transactions. Others were ¢77 billion issuance of credit guarantees to Vanef for acquisition of STC without the board's approval and a proper asset and business valuation, ¢528,671 million payment of variation cost in excess of approved amount, $594,000 for over pricing of property (Massillia House) purchased from CFAO by Databank for the OBOTAN Garden project and $120,000 inappropriate payment of real estate agency fee in relation to OBOTAN Garden project. Other losses were ¢74 billion mismanagement at WAHOME and $15 million for short delivery of about 230 rooms paid for by SSNIT in the Golden Beach Hotels transaction, $330,000 and another $60,000 as double payment to financial and legal consultants of Golden Beach Hotels, ¢1.751 billion for investment in OGUA Hotels Limited without the board's approval and without any loan agreement, DM2.78 million credit guarantees to BMK Particle, ¢15 billion for misapplication of loans by SSNIT staff seconded to manage Bridal Trust, ¢450 million for untimely disposal of 1.0 million shares in ALUWORKS close to dividend payment and ¢120 million placement of the ALUWORKS share proceeds on call for seven weeks. Other areas of loss were: ¢2.29 million under payment of share subscription by SIAT Ghana Ltd, ¢1.08 billion underpayment of share subscription in SIAT by Africa Tiger Mutual Fund, $370,505 and another. $2.0 million for over pricing of equipment at BEESBLOCK and $765,000 for alleged lack of evidence that Regimannuel Gray paid up in its share subscription in BEES BLOCK. The rest were: ¢1.35 billion non-payment of share contribution by partner in Grand Regency and ¢528 million excess payment to project consultants on Legon Students Hostel, ¢5.7m default on SSNIT loan to FIDAN Construction Ltd and 100% provision for bad debt without recourse to collateral, $144,381 for manipulation of the bid process for purchase of computers and accessories and ¢63.6 million payment in excess of acquired shares in Grand Regency Hotel. The third place was taken by the rejuvenated SIC, with a loss of ¢71,757 billion over three transactions. The excessive and reckless underwriting of Credit Guarantee Bonds by the past administration recorded ¢67 billion loss. The ¢257 million stood in the name of the former board chairman who was said to have used his position to benefit from a credit guarantee and defaulted in repayment. Then came ¢4.5 billion procurement of Arrive Alive playing cards at inflated price. This deal was carried out without the board's approval. Interestingly the new management of the SIC under the leadership of the Managing Director Peter Osei Duah, has managed to scale down the debt to ¢12.5 billion in less than four years in office. TOR recorded a total of ¢67.719 billion in four transactions of which $4.0 million was as a result of award of contract for a steam boiler plant without tender and the board's knowledge and another $1.002 million contract for the construction of storage tanks, surrendered to a contractor without competitive bidder. Again £942,333 went into glass-reinforced pipes fund, which turned out to be defective after installation while payments were made to the suppliers. The report revealed that $1.2 million /£113,753 award of hedging contract to UBS was done without the board's blessing. Fifth on the ladder of the league is the Ghana Reinsurance Company which recorded a total loss of ¢46.957 billion from four transactions. These were £3.3 million investment in Meridian BIAO also without the board's authorization, ¢360 million illegal investment in Celltel company and $28,500 loss of commission on Ghana Airways insurance cover and $17,637 procurement of computers at inflated prices. DIC picked the sixth position with ¢20.426 billion from four transactions, namely $400,000 transferred to Goldshield Contact Service Ltd for no services provided, $369,292 and ¢29.651 million excess funds released for Pan African Investment Summit without complying with laid-down regulations and $1,081 million and ¢4.362 billion recorded as excessive payments to particular companies for advertisement. It emerged that ¢120 million was paid to the board of directors as 12 months sitting allowance though there were only three sittings in the year. ECG was next in line with ¢13.956 billion loss from seven transactions. These include $1,218 million contract for meters supplied without approval with excessive mark up of the cost, ¢67,070 as over pricing of Cable Lugs by the supplier, ¢61,409.61 over pricing of tyres by suppliers, £25,371 over pricing of tyres by suppliers, £67,754.61 over stocking of tyres; ¢20,021.95 unfair pricing and overstocking of tyres and $4,794.4/¢31.5 million unfair pricing and overstocking of protective clothing. There were also system losses of ¢256 billion per year. GWCL followed ECG closely in eighth position with losses of ¢10,623 billion from four transactions. The National Insurance Commission incurred a total loss of ¢1.409 billion from four transactions to place ninth: $96,500 change of Ghana Airways reinsurance brokers for a personal commission; $28,500 loss of commission by Ghana Reinsurance over the Ghana Airways change of broker; ¢253.346 million over payment to supplier of stickers and return forms; ¢806 million excess expenditure on private property of NIC officials and Volvo Car with the registration number GR 4588 which was in the custody of the former Commissioner on his own authority. The BOST placed 10th with a loss of ¢1.268 billion from four transactions. The highlights of these deals are ¢501 million non-invoicing of oil products to oil marketing companies and ¢245 million non-deduction of withholding tax from payments to suppliers, ¢469 million spent on haulage claims without delivery notes and waybills, ¢44 million into non-delivery of Assets Register despite payment. GHEL's loss of ¢821.473 million was from four transactions, made up of $18,505.5 payment of foreign medical bills to people which did not receive board's approval and ¢193 million payment as directors' monthly allowances from November 1998 to October 2000 even though there were only two meetings during the period, £25,094.67 over payment for supply of materials and ¢118 million wrongful payment as director's fees from March 1997 to July 1998.